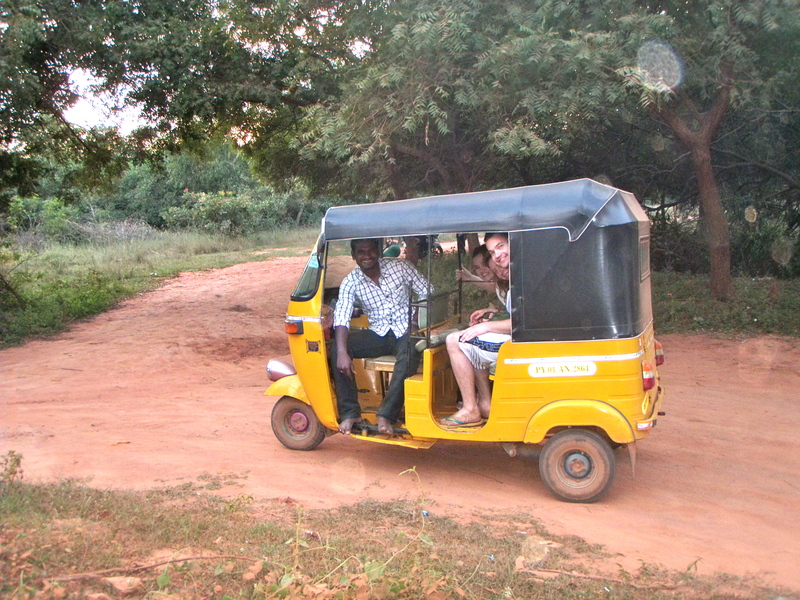 Yet another amazing day in Auroville. After a serene morning run through the red dirt and thick green forest, us AUP students met at La Terrace to check in and enjoy a delicious breakfast. We had the rest of the day free and decided to make the most of it. One of the students had met a beach conservationist named Mikael last week, so we decided to go back to try and find his organization to learn more about their cause. We jumped in some tuk-tuks and after a bumpy and somewhat chaotic ride through speeding traffic and small side streets, we made it to the beach. 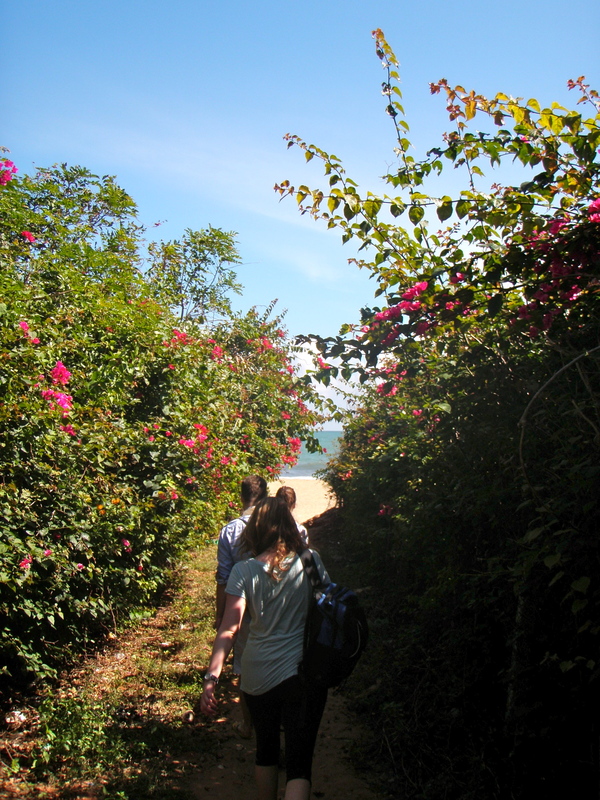 We walked along the sand until we found Meera Youth Camp, the beach conservation organization that Mikael leads. He and an international group of volunteers work on preserving beach erosion, which has been a huge problem since a cyclone hit in 2011. Although we stopped in just to say hello, Mikael warmly invited us to stay for lunch, as they were just about to get fresh vegetables from the market anyway. We accepted his kind invitation and once the vegetables had arrived, we all began the cooking process together. It was quite a site with all 13 people in one open-air kitchen, each lending a hand. 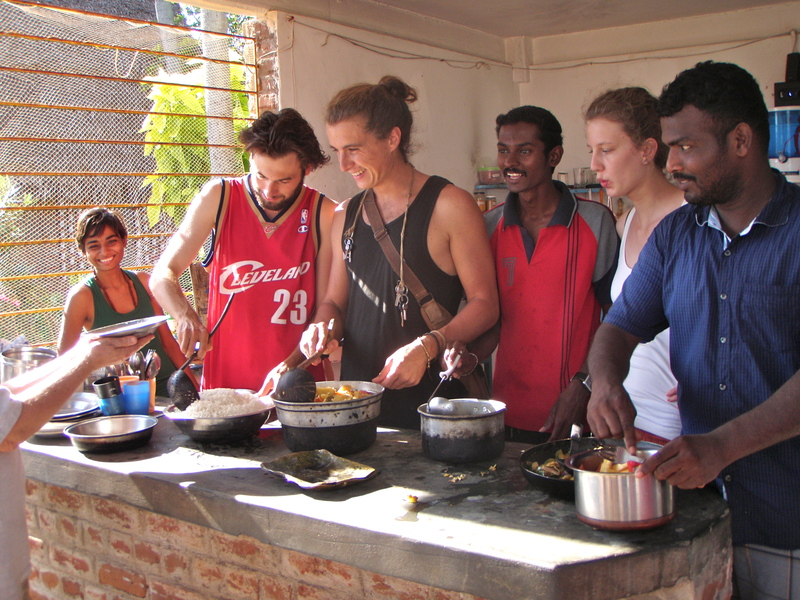 There was a real sense of community, one of Auroville’s key principles, as we all worked together to create the delicious meal. 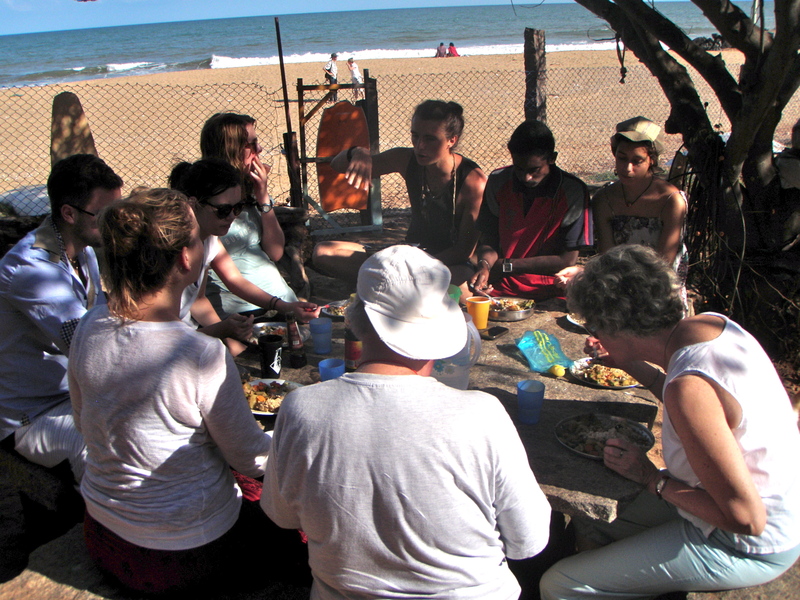 Once the meal was prepared, we all sat around a stone table and listened to Mikael’s story. Originally a prestigious tax lawyer in Paris, Mikael realized that his heart was not in this line of work so he decided to travel for a year, Auroville being on his route. 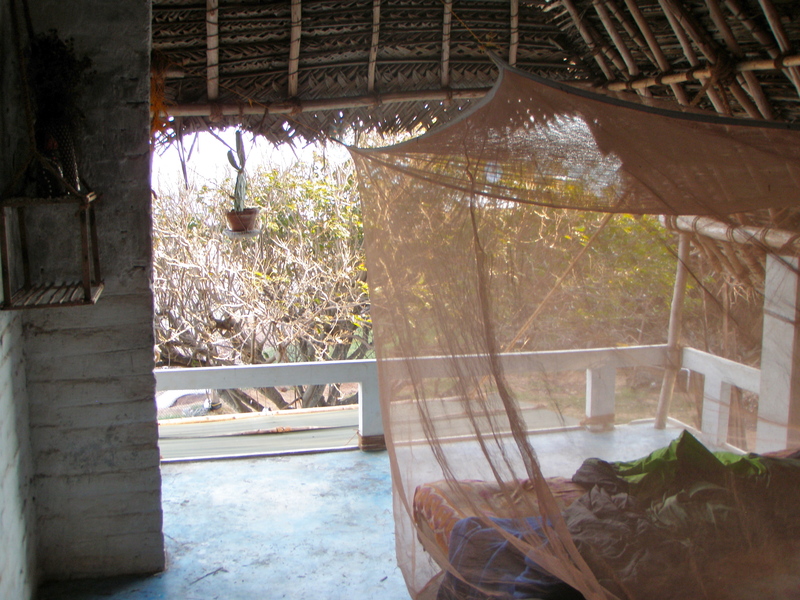 After spending 10 days here, he decided that Auroville was where he needed to be. He gave up his job and material possessions and began to work on his current project to protect the beaches along the east coast from further erosion. Although he still goes back to Paris from time to time to work on his PHD in volunteerism, the Meera Youth Camp has become his ultimate passion. Although the cyclone had displaced large amounts of sand, it usually comes back naturally with the tide within just a couple of years. 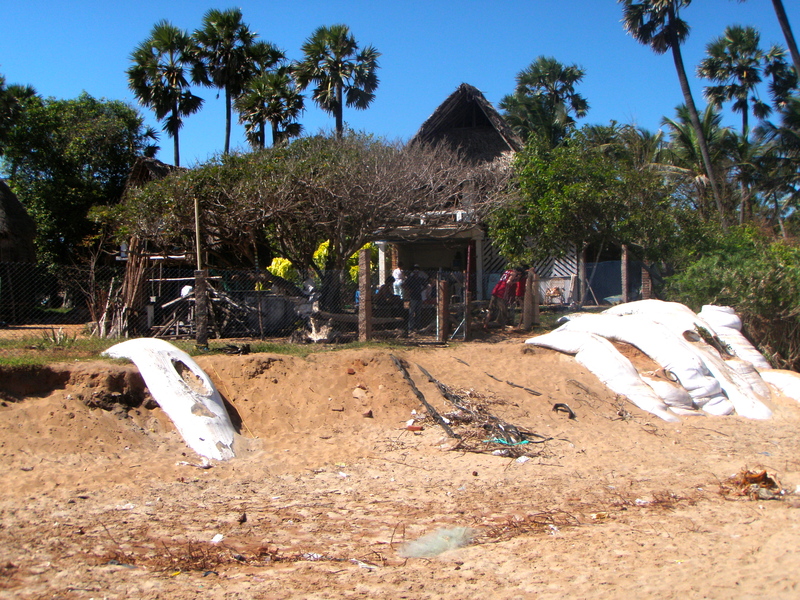 The problem in this particular area is that the sand has not been able to come back because it is blocked by a nearby port that extends unnecessarily far into the ocean. One of Mikael’s main goals is to shut down this port, that is apparently being used less and less, to facilitate the sand coming back. He claimed that if no changes are made by August 2014, the Meera Youth Camp will be in the water. For now they have sandbags out, ready to be used if needed. Despite the risk of its disappearance, Meera continues to work towards its visions and goals focusing on sustainability. Although the youth camp is slightly outside of Auroville, Mikael’s vision for the facility has a similar concept, as he wants to make it entirely self-sustaining and autonomous. They are on their way as they already run on minimal electricity and have a small garden where they grow vegetables. Mikael hopes to purchase the neighboring plot of land to expand his garden and rely less on the village markets. He has a very minimalist outlook on life and believes that people consume far more than they actually need. He believes that what is important in life is love, hard work, and passion – everything else will follow. We spent the entire afternoon listening to him and discussing his visions, along with those of his inspiring volunteers. At the end, he gave us a tour of some of their tree houses that they live in on the beach, all built by the volunteers and Mikael together. It was very inspiring to hear from Mikael and his eco-conscious group, as they are very determined to fight for their project to stop beach erosion in anyway they can, even if just by spreading the information. His ideas about consumption and how people too often take more than they need is relevant on a global level and is the source of many problems today including those surrounding waste, pollution and water consumption. I wish Mikael and his team the best of luck in his beach erosion project and in becoming a self-sustaining organization as he hopes for. 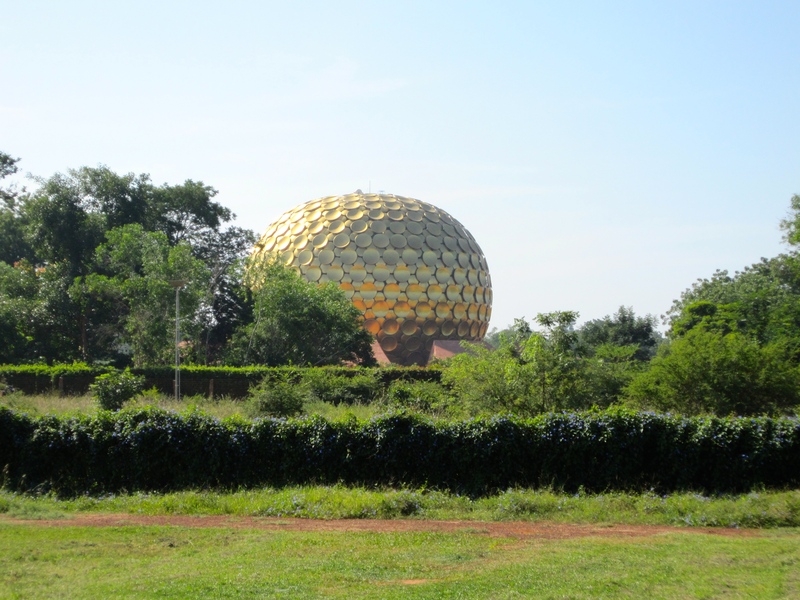 As I was preparing to come to Auroville, one of the things I was mostly looking forward to see was the Matrimandir – the impressive golden flattened sphere that extends out into twelve petals surrounded by an idyllic garden. It is often misinterpreted as a temple or some kind of religious building and since it is located at the centre of Auroville one can think that the town is built around a religious creed and that Aurovilians belong to an exclusivist sect. This is not correct and my aim here is to briefly explain what the Matrimandir is and what my perception of it is after my visit. 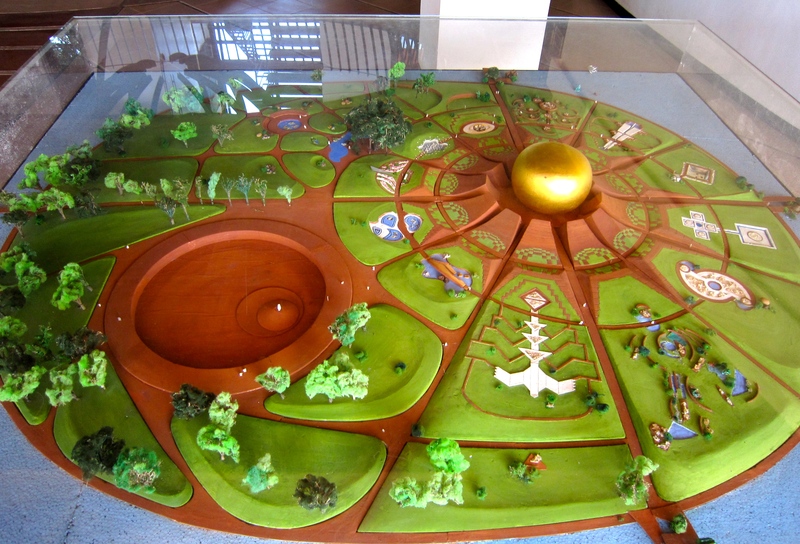 The Matrimandir is a place to develop a “union with the divine manifesting in a progressive human unity.” It is considered the soul of Auroville since it is located at its centre. Yet, the Matrimandir is not a temple – and more specifically it is not a temple for the Mother of the Sri Aurobindo Ashram who launched the project of Auroville in 1965. It is a place dedicated to the Universal Mother, Mother Nature – or whatever you may like to call Her. This is a concept that is well known in Hindu culture, but for Westerners (and I include myself in this category) the meaning of this building is often difficult to understand. The Matrimandir wants to be the symbol of the Universal Mother and the place where “people will not come for a regular meditation or anything of that kind; it will be a place for concentration, for trying to find one’s consciousness.” This understanding of the Matrimandir is in line with the idea that Auroville is a site of spiritual research to strive towards the living embodiment of an actual Human Unity. The Matrimandir’s construction started in the earliest years of Auroville – it required the first Aurovilians to come together and work together as a unified community. Visiting the Matrimandir is no easily done thing. One really needs to want to visit it as there is a specific process one must follow that is quite lengthy. Now one may somewhat hastily and superficially observe that this is a sort of “ritual” or initiation which are concepts that belong to any religion. Yet, I think that all the steps are there simply to ensure that the visitor puts effort into his or her visit and actually thinks about finding his or her consciousness. I am not saying that entering the Matrimandir equals having a revelation about one’s self, but the whole experience is entrenched with powerful symbolism. First, one sees the Matrimandir from a distance at a specific viewing point. Then, usually the following day, one is allowed to enter the Inner Chamber after viewing a short documentary and receiving additional instructions by a guide. In the Matrimandir, there are no windows and there is always a sort of clear half-light. One descends down before entering the Matrimandir and one comes up once inside it to reach the Inner Chamber. Everything is a symbol, but it is up to the individual to perceive those symbols. There are neither ornaments, nor music, nor incenses. 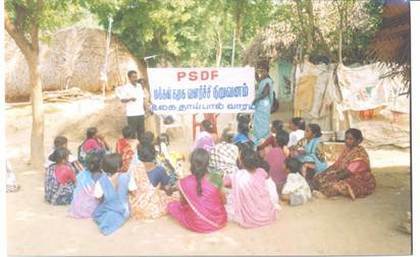 People can sit anywhere but they must remain silent and as still as possible. Once you exit the Matrimandir, you can wander in the garden dominated by a large banyan tree, the geographic centre of Auroville. My experience leads me to conclude that the Matrimandir wants to stimulate or facilitate inner progress of anyone wanting to enter it. Overall, I see the Matrimandir as a symbol of bringing order within oneself to establish order around oneself. As such, entering the Matrimandir is a very subjective experience and I cannot do much more but suggest you to visit it and see what it means for you! Welcome to the official AUP blog of the 2013/14 Sustainable Development Practicum. This blog will also be featuring posts by students of Linneaus University, Sweden. We are twenty international students sharing one community space and, from mid-December to mid-January, we will be exploring Auroville, India to gain insight into sustainable practices. The issues that we will be exploring include: environmental sustainable development, women’s empowerment, micro-credit financing, sustainable enterprises, socially responsible businesses and cultural heritage preservation. During the first two weeks in Auroville, we will meet intensively with an array of NGOs, sustainable businesses and community action groups. For the last two weeks, we will each be working with one of these organizations to develop a project that advances and enhances their communications in some way, whether that be linked to fundraising, public relations, grant-writing or many other areas. In our free time, you can find us biking around Auroville, exploring the grand market at Pondicherry. attending many cultural events and soaking in the experience of getting to spend a month in this unique place. Thanks for reading and we hope this blog will provide a helpful and interesting glimpse into our experience.